Captain Eugene Cernan and Captain Jim A. Lovell meet the press at the Adler Planetarium’s film screening of “The Last Man on the Moon”. To celebrate the anniversary of man’s last steps on the moon during the Apollo 17 mission, the Adler Planetarium hosted an exclusive screening of The Last Man on the Moon, a documentary based on the book of the same name by Captain Eugene Cernan, and a lively panel discussion following the film with NASA astronauts Captain Cernan and Captain Jim A. Lovell Jr. on Sunday, December 13, 2015. Filmmaker Mark Stewart’s 90 minute documentary won’t be released to the public until 2016 and chronicles the lives of Apollo mission astronauts with a focus on Captain Cernan’s life as a young navy pilot to his selection into the astronaut program, going into and walking in space and finally leaving his steps, as well as his daughters initials on the moon’s surface. The archival footage takes us back in history to witness the successes, the tragedies, and the boldness of the human spirit as we began the space race. The film also shows the other, more personal side of the sacrifices and the losses in regards to wives and family that become part of the job. Opening with Cernan standing on the now deserted Project Mercury launch complex in Cape Canaveral Florida, is a moving moment. For those unfamiliar with the location, it doesn’t give any hint that at one time Redstone and Atlas 5 rockets that carried Freedom 7 capsules with our nations first astronauts were launched from there into space. It is a nostalgic moment and adds to the film’s overall examination of not just the Apollo 17 mission but of the Mercury, Gemini, and all Apollo missions that preceded NASA’s last mission to the moon. 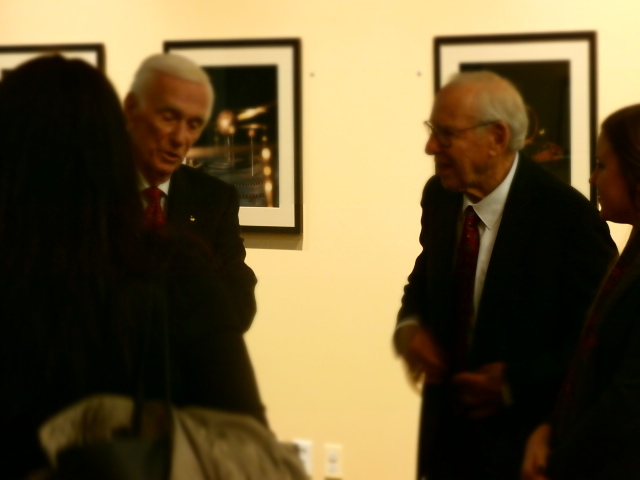 The magical part of meeting and talking to both Gene Cernan and Jim Lovell is in listening to their stories. Both men are in their 80’s. Cernan is 81 years old and Lovell is 87 yet the sparkle in their eyes and the laughter they both shared as they talked before the screening of the film are special moments that both of them have shared as NASA astronauts and trailblazers of our space program. As I talked with them and shared how my outreach to inspire young people to dream big and reach for the Moon and beyond as they did, I realized that opportunities such as this are very special and will, in the future, become nonexistent. We will have the newspaper articles, the television network archives, and NASA footage to look back and remember but it cannot compare, by any means, to living history of the live words of those who have lived the experiences. In the Q & A that followed the film, both Cernan and Lovell gave personal reflections on looking at Earth from space and the awe that comes from the experience as well as a disappointment that NASA is no longer looking at the moon as a destination for exploration. I have done a lot of moon outreach programs over the years and when I do moon rock presentations in the future, I can add that I have met and talked to one of the astronauts who brought back Lunar samples from his walk on the moon. Our moon is an object of wonder and to quantify that statement, grab a telescope, go outside, and get the moon in the viewfinder. Then just let your eyes wander over the surface to see the craters, mountains, valleys and other surface features as they never appear in a one dimensional environment. At this point, you totally appreciate and understand Cernan and Lovell’s personal statements about our abandonment of the moon. Thanks to the Adler Planetarium for hosting an “out of this world’ experience. If you are in Chicago, visit the Adler and spend some time in the new “Mission Moon” exhibit which contains personal artifacts from Captain Lovell, an opportunity to look into his Gemini 12 capsule, and tells a more human side of the space race.